Holders of Texas alcohol permits, such as the mixed beverage permit, the private club registration permit, and several others, will soon need to renew their surety bonds as the yearly deadline of December 31st approaches. 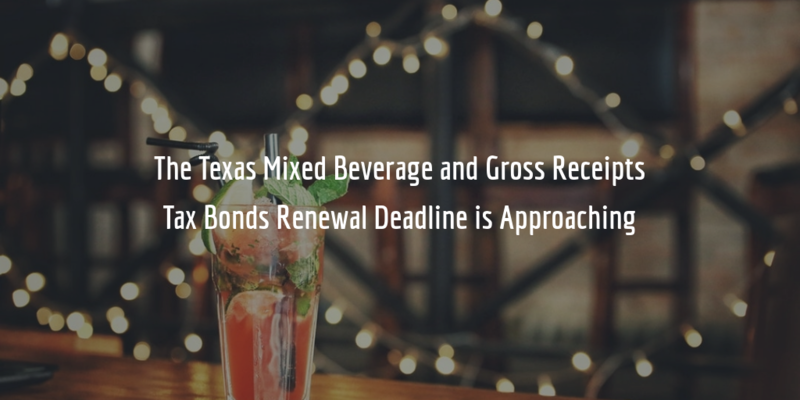 Permittees are required to obtain two types of bonds – the Texas mixed beverage sales tax bond and the mixed beverage gross receipts tax bond in varying amounts. Read about the renewal, who needs to get a bond, and how much your bond may cost below! The Texas Alcoholic Beverage Commission (TABC) issues and renews all so-called liquor or alcohol permits in the state. Among these, mixed beverage and private club permit holders are required by the TABC as well as the Texas Comptroller of Public Accounts to obtain two types of sales tax bonds when applying for or renewing their permit. This requirement applies to all varieties of mixed beverage and private club permits, including private club exemption certificate permit, mixed beverage or private club late hours permit, daily temporary mixed beverage or private club permit. It also includes holders of a caterer’s permit, a distiller’s and a rectifier’s permit. According to Sec. 61.03. of the Texas Alcoholic Beverage Code, permits are issued for two years at a time. Bonds that are issued for permit holders must be issued for the same duration as are permits, and must be continuous. Even though these bonds are continuous, bonded permittees must pay a premium on these bonds every year, or for a portion of a year, depending on the expiry date of the permit, according to the Texas Tax Code. The purpose of these bonds is to guarantee that holders of alcohol permits in Texas pay the required taxes on any alcoholic beverages they sell to consumers. The taxes that need to be paid are a 6.7% mixed beverage gross receipts tax, and an 8.25% mixed beverage sales tax. According to the Tax Code, these bonds are to serve as security for the payment of such taxes and to provide compensation if a permittee is delinquent in their payment. The exact amount of the bond that a permittee must obtain is determined by the Texas Comptroller upon applying for a permit initially or when renewing one’s permit. Your bond’s cost is a fraction of the full amount of your bond. How much you need to pay is determined by the surety with which you apply for a bond. When you submit your bond application, the surety reviews your credit score as well as other aspects of your personal financial status and provides you with a rate at which you can get bonded. Applicants who have high credit scores are typically required to pay low rates on their bonds. Those with perfect credit, above 700 FICO, can expect to get a rate between 1% and 3% of the total amount of their bond. Those with a lower score, but still above 650, can receive a rate that is up to 5% of the bond amount. If you have been asked to pay a 3% rate on your bond, and your bond amount is $20,000, you will need to pay $600 to get bonded. Once you have been offered a certain rate, you can improve that rate by improving your credit score. This means that when you apply to renew your bond, your surety may offer you a better rate if your credit score and personal financials have improved since you got bonded previously. If you want to know more about these bonds, call us at 866.450.3412 or contact us through our website!